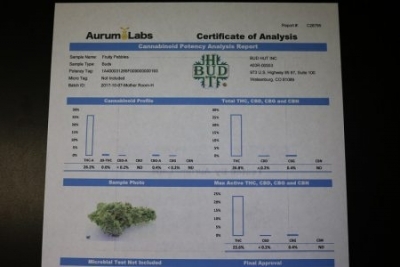 We picked up a nice aromatic, potent sample of Fruity Pebbles at the Bud Hut in Walsenburg, Colorado. It did not disappoint! Genetics: Alien Genetics developed Fruity Pebbles by crossing Tahoe Alien, Granddaddy Purple, and Green Ribbon. Flavor and Aroma: With a sweet and fruity flavor and aroma, Fruity Pebbles definitely lives up to it's namesake. 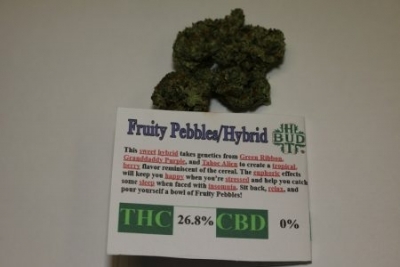 Effects: Fruity Pebbles is the perfect strain for a relaxing day. It will keep you in a happy and euphoric state of mind. Chill, positive vibes were experienced by our review crew. Do be prepared for some dry mouth. You'll have some sativa energy at first, that can settle into a sweet relaxation finish. On our couch lock scale, we rate it at a 5. Fruity Pebbles is equally good for day or nighttime use. Medicinal Uses: Fruity Pebbles is an excellent stress and anxiety reliever. It's also good for mild pain management, with the benefit of mild muscle relaxation as well. Potency: This expertly cultivated specimen was lab-tested at 26.8% total THC and 0.2% CBD. Grow Info: Fruity Pebbles tends to grow tall due to its sativa characteristics, and can show some purple. It produces above average yields, and generally flowers in 8-9 weeks. Copyright © 2019 WeedSearch. All Rights Reserved.